What is the process for having a prosthetic or orthotic device made at PawsAbility? To have a device made, a client needs to bring their dog to our shop in Toronto for the three steps of casting, test-fitting, and fitting of the final device? The whole process takes from 1-2 weeks to complete. Are there any special arrangements that can be made for clients coming from outside of Toronto? Often the first two steps can be combined and done on the same day to save one trip into the city. It would then be necessary to return only once more for the final fitting. In some cases, a shortened turn-around time can be done to accommodate out-of-town clients who want to stay in the city overnight and have their final fitting the following day. Does PawsAbility require a veterinary referral? All animals that are seen at PawsAbility must have been assessed and their condition diagnosed by a veterinarian prior to their first appointment. To make an informed decision about whether to access prosthetic or orthotic care, it is important to know what the other treatment options might be and to have considered the possible benefits and limitations of all options. The Informed Consent Form (printable from this website) is the paperwork needed for this referral. What is the cost of a prosthetic or orthotic device? The cost of a device depends on the type of brace or prosthesis required and it's complexity. Most devices will fall between $500 and $1500. Prices include the appointments and steps that are necessary for the making and fitting of the prosthetic or orthotic device, as well as the device itself. The cost of a device for an animal other than a dog will be estimated on a case by case basis. The HST is applied to all devices as an addition to the estimated price ranges. Are all types of "custom braces" really the same? Orthotic devices can vary vastly in how they are made; what materials they are made of; how much they cost; and how much support they can provide. It is important to consider all of these factors when deciding on what type of brace to get for your pet. If a device is made from a cast of the affected limb it allows for an extremely accurate fit and also allows for the use of materials that have more structure, such as plastics and fiberglass laminate. These factors combine to create a significantly more supportive brace when compared to other methods, such as circumferential measurements being taken and a brace being created out of a soft material such as neoprene. 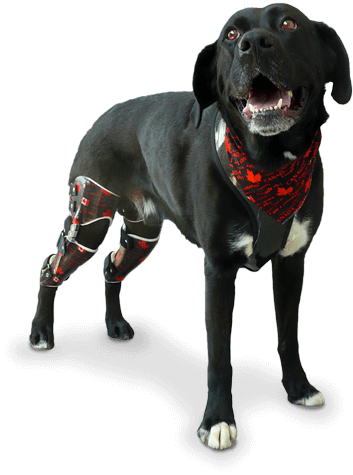 How well do dogs tolerate prosthetic and orthotic devices? In general, if a device is properly designed and fits well, they are accepted quite readily. Increasing wear-time gradually and regular monitoring of the dog's skin are two factors that increase the chances for success in device acceptance. Pairing the use of the device with a favourite treat or activity also can increase the positive associations that a dog will have with the prosthetic or orthotic device. How do devices stay in place on the dog? Devices are made from a cast of the affected limb and because of this they are able to fit very closely and provide maximal control. The contours of the limb are captured in the cast and they get transferred to the device. This ensures that orthosis or prosthesis has just one place to sit properly that there is very little opportunity for it to slip down or rotate. In addition to resting the brace on load-tolerant areas of the limb, velcro straps with adjustable pads are used to hold the device in place. Occasionally, depending on the type of brace and the structure of the dog, an additional suspension strap that goes over the body may have to be used to assist in keeping a device at the proper level. Do they rub or cause skin issues? A device that is properly designed and fitted should not be the cause ongoing skin issues. With that said, much responsibility rests with the owner as they are responsible for skin monitoring, keeping the device clean and dry, and bringing the device in for adjustment if needed. Whenever a dog begins to wear an orthosis or prosthesis the skin will need time to adapt to the pressures within the new device. If wear-time is increased gradually and skin is watched carefully, this adaptation need not result in skin breakdown. How long should a device last, and what sort of maintenance is necessary? If it is properly maintained, and if no physiological changes occur in the limb, a prosthetic or orthotic device may last many years. The fiberglass laminate that is used to form the structure of the brace is extremely durable, but the internal padding and velcro straps are more vulnerable to wear. Keeping a device clean and dry will go a long way to ensure that it lasts. Devices that include a section of support under the paw may require more maintenance since the foot section is in constant contact with the ground. Re-soling and replacement of straps are the most common repairs that may be required for a device. It is recommended that the prosthetic or orthotic device be kept as dry as possible. Aspects of the device will wear more quickly if they get repeatedly wet, and in addition, a dog's skin is more vulnerable to irritation if they are walking with a wet leg in a wet device. Over-boots are appropriate to cover some types of devices, and others can be protected with a "leg-warmer" type of cover.